The Nokia XL is one of three products that make up the manufaturer's new X range of Android-powered smartphones. While the affordable Nokia X sports a 4-inch screen and the Nokia X+ is essentially the same with better memory and storage options, the XL is a larger handset with a 5-inch display. All three phones in the new X family run Nokia's new heavily skinned version of Android, which looks confusingly like the tile-based Windows Phone 8 interface on handsets like the Nokia Lumia 1020 and Nokia Lumia 1520. Article continues after the video. 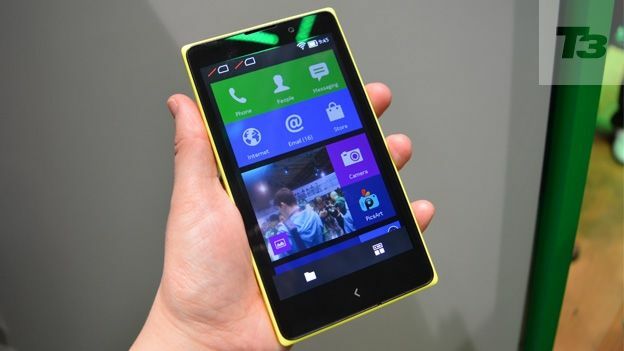 Sporting a similar design to Nokia's range of Lumia Windows phones, the XL is available in the usual range of bright colours. Measuring 141.3 x 77.7 x 10.8mm, this big-screened phone probably isn't a one-handed affair for most people. The XL sports a 5MP camera with autofocus and flash, and unlike the Nokia X and X+, it also includes a front-facing camera (2MP). Like the other phones in the range, you'll be guided towards Microsoft's cloud, rather than Google's and you won't have access to the Google Play - it's Nokia's own store or nothing. The large 5-inch LCD screen is decent enough but the 800 x 480-pixel doesn't really make the most of it and colours end up looking a little flat. Obviously we've only had a quick play under the bright lights of Nokia's MWC stand but we'll look at this more closely as soon as we can get our hands on a review sample. Like the Nokia X and X+, the XL runs on a Qualcomm Snapdragon 8225 dual core chipset, with maximum clock speed of 1Ghz. There's 768MB of RAM and up to 32GB of storage - which is expandable via the micro SD card slot. We found that the interface had a slight lag although we're guessing that this isn't the very final software that we'll see on the retail version. Like the Nokia X, the Nokia XL looks confusingly like a Windows phone rather than an Android phone thanks to Nokia's new tile-based menu screens. Whether that's a concept that will be successful is impossible to say at this stage but we look forward to trying it out properly as soon as a review sample arrives at T3 Towers.